"The place name Kumagaya has the same spelling in Japanese as the family name Kumagi, immediately suggesting the famous twelfth-century warrior Kumagi Naozane, who son, Kumagi Kojirō Naoie, is shown in the print. Armor and weapons make up the series title border, and the inset landscape is in the shape of a battle fan, used to signal orders. Kumagi Naozane was a retainer of the Minamoto (or Genji) clan who helped drive the rival Taira (or Heike) clan into the sea at the battle of Ichinotani in 1184. His tragic encounter with the young Taira warrior Atsumori is recounted in book 9 of the Tale of the Heike (Heike monogatari). Atsumori was riding into the sea to join the remaining Taira as they made their escape in boats when Naozane, using his fan, challenged Atsumori to return and fight him. Atsumori gallantly accepted the challenge and was killed by the older, more experienced warrior. Naozane was so filled with remorse at having killed a fine young man who resembled his own son that he gave up his position as a samurai and became a Buddhist monk. Kuniyoshi, however, illustrates not the classical story but the kabuki play based on it, which alters the historical incident to make it even more complicated and dramatic. In the kabuki play The Chronicle of the Battle of Ichinotani (Ichinotani futaba gunki), Naozane's son Kojirō Naoie is captured by the Taira and taken into their seaside fortress. He is rescued, and, soon after, Taira Atsumori emerges for his fatal fight with Naozane. In fact, however, Naoie has deliberately changed places with Atsumori while inside the fortress, in order to save his father from a terrible conflict between duty and honor. As a Minamoto warrior, Naozane is obligated to kill as many Taira as he can; but he owes a debt of grtitude to Atsumori's mother and so cannot honorably kill her son. 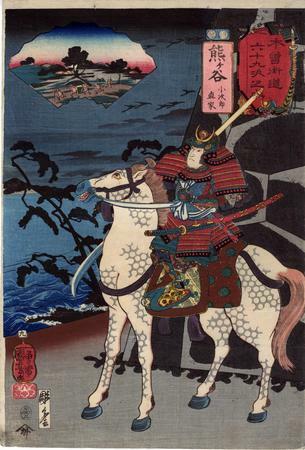 Kuniyoshi shows brave young Naoie riding out to meet his death at the hands of his own father in order to preserve the family honor." Quoted from: Utagawa Kuniyoshi: The Sixty-nine Stations of the Kisokaidō by Sarah E. Thompson, p. 34. There is a full-page color reproduction on page 35.